Parsnips are a root vegetable belonging to the Apiaceae family. They are especially high in potassium as well as zinc and iron and vitamins K, C and B. There are many ways of preparing parsnips but for me, you simply can’t top a spiced parsnip alongside a tasty Sunday Roast. This recipe also lends itself well to roast carrots. Use leftover parsnips to make my Parsnip & Egg Salad w/ Puy Lentils & Watercress (click here for recipe). Pre-heat the oven to 200C. Boil the parsnips in salted water for about 7 minutes, until they soften slightly. Drain and set aside. 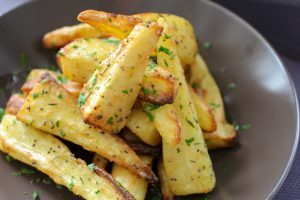 In a large mixing bowl add a good glug of olive oil, the mustard seeds, thyme, and cumin then add the parsnips using your hands or a large spoon to help coat the parsnips in the spiced oil mixture. Transfer the parsnips to a baking tray or roasting dish and then season with salt and pepper and cook in the oven for about 20-30 minutes, until they start to caramelise or brown around the edges. Drizzle a small amount of honey over the parsnips then return to the oven for about 3 minutes, if you leave them in too long the honey will burn and make your parsnips taste bitter. Remove the parsnips from the oven, sprinkle over some chopped parsley and serve.